In 2015, the legendary Steve's Lunch suffered a fatal blow when fire ravaged the 24-hour diner on Cleveland’s near-west side. According to first responders on the scene, the 60-plus years of accumulated grease turned the building into a giant Molotov cocktail, leaving nothing in its wake but heat, smoke, ash, and fuzzy memories. For many people in Cleveland, tiny, tatty Steve’s was the provider of late-night sustenance when little else was still open. It was also the place where countless diners got to know and love the Polish Boy. After a night of heavy drinking, this heroic sandwich offered the sort of fuel and strength needed to accomplish the task of making it safely home. "It wasn't Poland, that's for sure!" Not to be confused with the Big Easy’s po-boy, the Polish Boy is a uniquely Cleveland invention, and its praises have been sung by notable magazines and celebrity foodies like Anthony Bourdain, Adam Richman, and, naturally, rabid Clevelander Michael Symon. So you might be wondering, what the hell is a Polish Boy, and what does it have to do with Cleveland? At its heart is kielbasa, which is a general term for a Polish smoked sausage made with beef, pork, or a combination thereof. 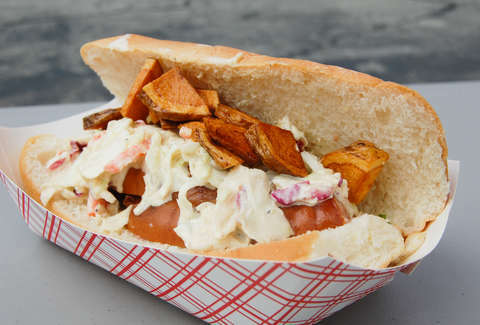 The sausage is grilled or griddled, tucked into a sturdy hot dog bun, and topped with coleslaw, French fries, and barbecue sauce. Finishing one is a feat; polishing off two is the stuff of legend. Proper attire for eating a Polish Boy is an apron, or anything you don’t mind tossing into the trash. For a sandwich that is rightly celebrated and roundly trumpeted, there is a paucity of facts on its origin. Compounding the problem is the fact that "Polish Boy" was once a general term for any large kielbasa on a bun. Finishing one is a feat; polishing off two is the stuff of legend. My research points me to a man named Virgil Whitmore, who opened the original Whitmore's Bar-B-Q in the Mount Pleasant neighborhood back in the 1940s. Like any practical restaurant owner, Whitmore looked around at the ingredients he had on hand and came up with new and creative ways to use them -- not unlike Taco Bell. He had smoked beef sausage, he had coleslaw, he had French fries, and he had his famous barbecue sauce. Whitmore combined the ingredients and came up with this delicious mess of a sandwich, and replicates soon began popping up at other barbecue joints around town. Various Whitmore family members went on to open other Cleveland-area barbecue shops, including Mt. Pleasant BBQ, which opened in 1977 and is currently operated by Virgil Whitmore's grandson, Larry Turner. When asked where the Polish Boy originated, Turner responded, "It wasn't Poland, that's for sure!" But, he added, his shop has been doing them since day one, and they're still one of the most popular items on the menu. Proper attire for eating a Polish Boy is an apron, or anything you don’t mind tossing into the trash. These days, you can score Polish Boys not only at barbecue joints like Mt. Pleasant, Whitmore's, Hot Sauce Williams, and The Rib Cage, as well as the long-running and widely touted favorite, Seti's Polish Boys food truck, but also at a number of contemporary restaurants. You see, like the Cavs, the Polish Boy is making a huge comeback thanks to Cleveland-loving chefs who have picked up the baton and run with it. At Banter, a retail bottle shop/poutine eatery in the Detroit-Shoreway neighborhood, you'll find a deluxe version, with juicy house-made kielbasa, slaw, frites, and sauce, all tucked into a split-top bun. Michael Symon just opened his "Cleveland-style" barbecue restaurant, Mabel's BBQ, in the heart of Downtown, and there was no way he wasn’t paying tribute to his favorite sandwich. Order the Polish Girl and you’ll score a fat kielbasa from the nearby West Side Market topped with saucy smoked pork and coleslaw. Over at Picnic, a new "sausage-themed" eatery in the 5th Street Arcades, diners can score another version of the Polish Boy -- this one a char-grilled smoked pork sausage topped with -- you guessed it -- fries, slaw, and sauce. Douglas Trattner is a Cleveland-based writer and cookbook author. Visit his website.